A Mind Map is a tool that is used to visually organize ideas, thoughts and information. It is simply a collection of words and drawings that organizes thoughts and information around a single topic or problem. It is a nonlinear approach that reflects the way human beings think and organize information in their minds. It has many applications in personal, professional and educational situations. Mind maps can help quickly identify and understand the structure of a concept, making it easy to see how pieces of information fit together. They provide focus and clarity as only few words and phrases need to be written down. This can greatly increase your note-taking speed and make it easier to structure, classify, summarize and recall ideas and information. They can offer new insights into new possibilities and creative solutions to improve existing processes and practices. Mind maps are often used during meetings, workshops and brainstorming sessions. The facilitator may ask the team to sort out a complex idea or come up with new ideas in a problem-solving effort. Mind maps are also used to aid in decision making and planning activities. They allow to creatively generate and organize ideas, consider alternatives and come to a decision. More than this, mind maps can also support interviewing and studying by providing an alternative approach to conventional note-taking. They can also be used as a presentation tool and to consolidate information from different sources. Present the topic you are exploring and define the problem clearly. Draw a circle in the middle of a whiteboard or large sheet of paper then write in it the problem or topic you are exploring. 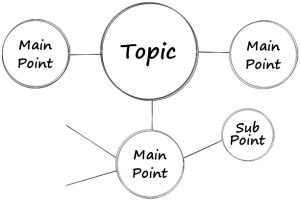 Initiate the key branches by identifying the main points related to that single topic or problem. Draw lines out from the circle to represent these branches. Brainstorm and add information to the key branches (main points) by creating more branches with yet greater detail. Use colors and add images, icons, symbols and shapes to make the mind map looks more pleasant to read. 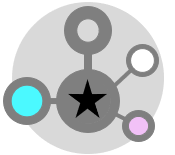 Show associations by connecting the related items with lines and arrows. This will help to see how one part may affect another. Provide the opportunity to add to the mind map later on as you come across new information. Mind maps can be drawn by hand during a planning session, lecture or meeting. A higher quality version could be drawn later when there is more time available. While most mind maps are created by drawing on papers and whiteboards, there are a number of software packages and websites that allow the creation of mind maps to manage larger amounts of information more easily. The following is an example of a mind map that was drawn using one of these software applications. The following is an example of a mind map that was created to help remembering personal development tools after reading a book on the subject. A research has suggested that mind mapping can improve learning and studying efficiency over conventional note-taking methods (The efficacy of the mind map study technique by Paul Farrand, Fearzana Hussain and Enid Hennessy (May 2002)). Images, shapes and symbols can help you remember, recall and retrieve information more easily. Using of single words and simple phrases will ensure that the mind map is more pleasant and easier to read. You’ll need to be persistent and patient in working with and mastering mind maps.